The day after a breakout moment on the debate stage that lit up social media and pumped more than $1 million into his campaign coffers, Ted Cruz sought to convert it all into momentum in a presidential race where he still badly trails. LAS VEGAS — The day after a breakout moment on the debate stage that lit up social media and pumped more than $1 million into his campaign coffers, U.S. Sen. Ted Cruz sought to convert it all into momentum in a presidential race where he still badly trails two other anti-establishment favorites. Citing Senate votes, Cruz canceled a Nevada trip Thursday, but his in-state supporters were willing to forgive him after a debate performance in which he condemned moderators for running the event like a "cage match." "He really kicked tush in that debate," said Victoria Seaman, a Nevada state lawmaker backing Cruz. Yet the post-Colorado debate high has its limits, and Cruz still has significant ground to make up against the two frontrunners in the GOP field, retired neurosurgeon Ben Carson and billionaire Donald Trump. While neither candidate stood out on the debate stage in Boulder, they appeared to do little to hurt themselves among voters drawn to the anti-establishment message — the same appeal Cruz is seeking to leverage in his bid for the White House. With the holiday season a few weeks away and Cruz stuck in the mid to high single digits in national polls, some Republicans are beginning to wonder how long the Texas senator can sustain his strategy of not taking the offensive against Carson or Trump. The two have liberal positions in their pasts that would be a feeding frenzy for a candidate like Cruz in any other scenario. For now, the focus is on Cruz's guns-blazing performance Wednesday night, when he tore into CNBC's moderators, saying their questions show why Americans don't trust the media and demanding a more substantive discussion. Inside a focus group convened by veteran GOP pollster Frank Luntz, the moment rated an average of 98 on a 100-point scale among both conservative and moderate participants. "He had the best reaction of any debate performance that we’ve measured in any campaign — ever. It’s really that simple," said David Merritt, a managing director at Luntz's polling firm. "He literally almost broke the dials." Cruz's campaign moved quickly to capitalize, revealing Thursday morning that it had raised $772,000 through midnight after the debate. By comparison, Carson took in half a million dollars during the debate and up until midnight. Appearing Thursday afternoon on Fox News, Cruz said his haul shot up to more than $1.1 million in the 22 hours following the debate's start. Combined with a volunteer force that now tops 77,000 — another announcement the campaign made Thursday morning — the post-debate haul shows Cruz is the "only conservative candidate equipped to compete for the long haul," an aide said. For the past few weeks, Cruz's campaign has appeared cautiously optimistic that it is finally getting the serious look it feels it deserves from national reporters, once-reluctant GOP leaders and rivals. Highlight reels aside, his campaign insisted he had an otherwise well-rounded showing on the debate stage, ranging from the rollout of his tax plan to a personal story about his father's conversion to Christianity. "We still have a lot of growth potential," Cruz adviser Jason Miller said after the debate. "There are a lot of voters out there who simply don't really know much of anything about Ted Cruz, and so one of our goals is to take advantage of each of these debates, continue introducing him. You don't just introduce him off one debate. It's a continual process of introducing him and telling more about him, and we're excited about how that went." Like their boss, Cruz's surrogates were reluctant to specifically talk about Carson and Trump after the debate. Miller said the attention and coverage Cruz receives from his Boulder performance — "He will have a really good next couple days" — may lead more voters to examine his record and see him as the "original outsider." 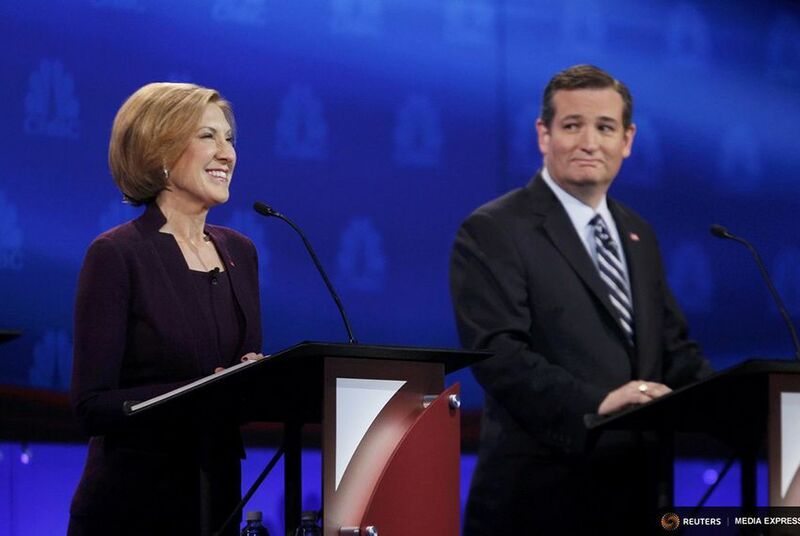 The debate featured Cruz in a reliable comfort zone: bashing an industry that is loathed by much of the GOP base. On the campaign trial, Cruz's flair for media criticism ranges from the facetious — he routinely jokes reporters will "check into rehab" when he becomes president — to categorically dismissive. Stumping earlier this month in Iowa, Cruz flatly told reporters the political preferences of the "mainstream media are not in line with the American people," and in post-debate interviews, he has suggested replacing future moderators with conservative pundits Sean Hannity, Mark Levin and Rush Limbaugh. Much post-debate attention also centered on U.S. Sen. Marco Rubio's showdown with fellow Floridian Jeb Bush, the former Sunshine State governor whose attack on Rubio's Senate attendance record seemed to backfire. If Cruz hit a "500-foot grand slam" with his media takedown, Rubio had "four solo home runs" throughout the night, said Johnson, who declared the Florida senator the winner. Phil Perine, a member of Cruz's Nevada leadership team, was heartened to see the two senators emerge with positive reviews, possibly telegraphing the contours of the race going forward. "I just think that Trump and Carson are going to fade, and Rubio and Cruz, not necessarily in that order, are going to be there to pick up the pieces," said Perine, the founder of Nevada grassroots group Siena Conservatives. Cruz had planned two campaign events Thursday evening in Las Vegas — the grand opening of a campaign office and a town hall — but canceled with the Senate set to debate a budget deal Cruz vociferously opposes. In a statement, Cruz's top adviser in Nevada said he was expecting "capacity crowds" at the stops and promised the senator would make it back to the state as soon as possible. It was not lost on political observers that Cruz's cancellation came the morning after a debate in which a fellow senator's attendance record came under fire. Asked in the Fox News interview whether Rubio was showing up enough for work, Cruz drew a contrast between himself and his Senate colleague dating back to the day after the second GOP debate, when in Cruz's telling, they both had fundraisers scheduled in California but only Cruz skipped his and hurried back to Washington, D.C., to register his opposition to President Barack Obama's nuclear deal with Iran. On Thursday afternoon, Cruz's supporters in the Silver State were willing to forgive his absence. Cruz ended up delivering a blistering 90-minute speech on the Senate floor, ripping the budget deal as another sign of unprincipled GOP leadership in Congress. "I’m very disappointed that he had to cancel here," Perine said, "but I understand he had to get back to the debate" in Washington. Cruz will be back on the campaign trail Saturday in Iowa, where he is scheduled to speak at a candidate forum hosted by the state party in Des Moines then go pheasant hunting with U.S. Rep. Steve King in Akron.